Darren* was constantly worried about his hair loss when he went outside and wanted a hair loss cure. Not only was he self conscious of others seeing his hair loss, but his thinning hair was exposing his scalp to the elements. Over the last decade Darren’s hair had shed steadily, his once thick hair was losing density in the crown and each year he noticed his temples recede a little further. It had taken 2 years, but after a lot of thought and research into a hair loss cure the 41 year old footy fanatic went to Ashley and Martin’s website to submit an internet enquiry. The consultant who looked after him at his free consultation asked Darren about his medical history and family history of hair loss. Darren’s grandfather had gone bald and to try and avoid this himself Darren had tried using over the counter remedies with no success. The consultant looked at his pattern of hair loss and together with the family history diagnosed him with Male Pattern Hair Loss, Norwood III vertex. A week after his initial appointment Darren came back to the clinic to enrol on a RealGROWTH® program. Darren’s life choices involved being fit and eating well and with no dietary factors impacting his hair loss or contraindications to commencing a RealGROWTH® program, the doctor prescribed his topical solution and anti-androgen tablets. Darren continued to come to the clinic regularly for Low Level Laser Therapy to get the best results from his medications program. 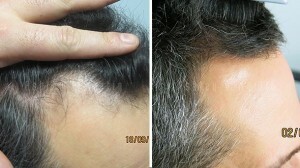 Sixteen weeks in to his program Darren was amazed he had found his hair loss cure. He could not believe how much thicker his hair was all over and the amount of new growth in his temples. Even other people had noticed the difference in his hair. A friend had noticed his new hair was growing through making his hair look darker and his wife had noticed it was looking thicker. The self esteem issues Darren had been experiencing had left him and he no longer thought about his hair when leaving the house.